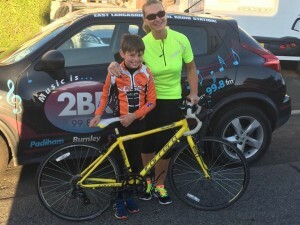 Thomas Inckle, aka Turbo Tommy, is 9 years old and loves cycling. 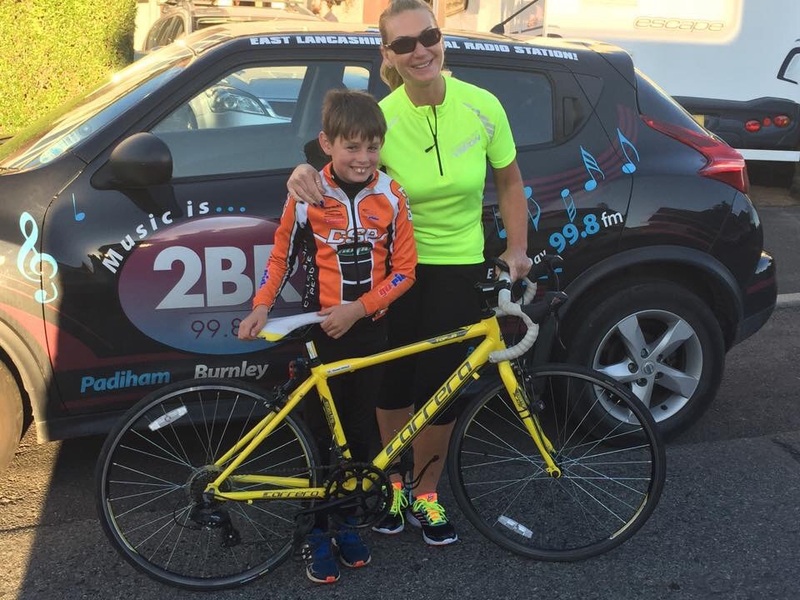 (Article from 2br radio) This weekend he’ll take part in a bike ride from Blackpool to Burnley General Hospital in aid of ‘Friends of Serenity’. The charity, based in Darwen, raise awareness of still birth and are currently raising funds for a new scan trainer for midwives to detect abnormalities in pregnancy. If they reach their £84,000 target, the machine would be based at Lancashire Women’s and Newborn Centre. Thomas and his family decided to plan a ride for this month, after he showed an interest in taking part in a bike ride earlier in the year from Edinburgh to Burnley – not realising the distance. He’ll ride alongside a group of chaps, known as Team E2B, on Saturday (26th September). Thomas told us what he likes about the sport: “It’s the fun of cycling that I enjoy really. We’ve had some good rides together to practice and we’ve spotted a lot of animals on the way. “I know that on the day, I’ll be really nervous and I’ll be telling my dad that I don’t want to do it, but I will really. I want to thank people for all the money they’ve given so far and hope that I get some more sponsors.” Elaine Keenan will also join the ride, she spoke about the cause they’re raising money for: “You don’t realise how many people have had still born babies until you start discussing it with everybody else. It’s a really, really good cause because so many families are impacted by this and it feels good to raise money for a good cause.” Friends for Serenity provide the hospital with memory boxes, miscarriage keepsakes and recently paid for and designed the new Butterfly Suite which is a bereavement room. The new project is fundraising for a Medafore Scan trainer that will help to detect abnormalities in pregnancies. Founder of Friends of Serenity, Joanne Edwards, gave the team thanks for their support: “I wanted to express our absolute gratitude and appreciation to Thomas, Elaine, the team and everyone involved for supporting our cause and working so hard. We couldn’t be more proud. They are absolutely amazing and what they are about to do is an outstanding achievement.” The charity’s aims are: To preserve and protect the health of sick pregnant women and those who have suffered a miscarriage, stillbirth or neonatal death in particular but not exclusively by: (i) providing and assisting in the provision of facilities and equipment at East Lancashire Women and New Born Centre not normally provided by the statutory authorities. (ii) supporting newly bereaved parents by the provision of memory boxes. (iii) providing qualified information by any means appropriate on the chromosome disorder Trisomy 13 for the public benefit. Elaine says the ride will be a new experience for her, as she’s not a keen cyclist: “I’ve only really been riding since mid August when I bought my bike. I’m petrified, I’ve only done 28 miles so far but this is 42 miles. I’m enjoying parts of the training – but not the hills, and road riding frightens me. “Thomas is ace, and we’ve not even known each other that long. He never stops talking and he’s kept me going in practice so I hope he will do the same for me on the day.” The ride is planned for Saturday 26th September from Blackpool Tower at about 11am and will end at the new maternity facilities at Burnley General Hospital.